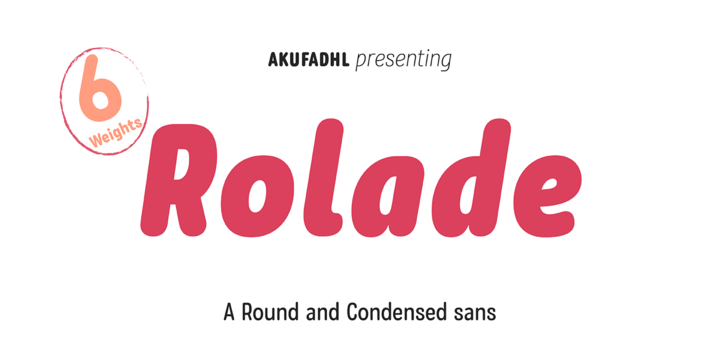 Rolade is a round and condensed sans serif typeface created by Fadhl Waliy ul Haqq and published by Akufadhl which is available in 6 weights (from Thin to Black) with accompanying italics, some useful OpenType features and language support. It was designed to be suitable for display purpose. Enjoy! Price: starting from $25,00 for one font to $150,00 for all 12 fonts. A font description published on Monday, September 25th, 2017 in Akufadhl , Fadhl Waliy ul Haqq, Fonts by Alexandra that has 2,284 views.